For years Jeff Willes (UFOsOverPhoenix.com) of Phoenix has been watching the skies diligently and because his eyes remain focused above, camera ready in hand, he has captured some of the best UFO footage on earth, bar none. Many are probably very familiar with the stunning daytime saucer Jeff videotaped May 24, 2003 or the remarkable pre-dusk Phoenix Lights video, adding a whole new dimension to perhaps one of world's most widely witnessed and documented UFO events. Well, Jeff makes history again, only this time in the hands of SyFy Channel's paranormal investigation squad via a new series called Fact Or Faked? Paranormal Files. The team, headed by former FBI special agent, Ben Hanson, seeks to dig out the facts and fictions of mysterious and baffling stories, legends, phenomena and viral videos. It's almost a paranormal version of Myth Busters, only considerably less obnoxious. During the making of Episode 1, "Burning Rubber/Hyperjump," the team put a 'ghost car' viral video through the paces of rational examination and found a very plausible explanation for a very curious head scratcher that has baffled many for some time. 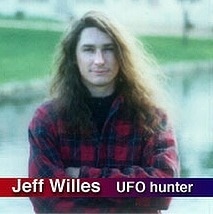 In the second segment, they take on Jeff Willes and his Phoenix lights UFO video. Jeff appears in the program and even turns over the very video camera he used to shoot the stunning balls of light which he captured appearing and disappearing around dusk, just above the darkening Phoenix mountainside. The team tried several reasonable re-creation methods to see if what Jeff captured could be duplicated without extraordinary efforts; this included making the lights appear on a sheet of glass using pen-lasers and lifting small helium balloons with tethered electric lamps dangling from them -- nothing worked. Close but no cigar. Finally the team decided to do a night time observation of the area with multiple cameras, including infrared video cams, while two members of the team wandered into the desert toward the area where the UFOs are apparently often seen and photographed. A strange noise interrupted their otherwise skeptical romp, a sound which even the more cautious and conservative member of the team said was 'unsettling.' Right about that time, another team member radioed to the lead investigator that the star he had been watching on the laptop monitor was suddenly moving. 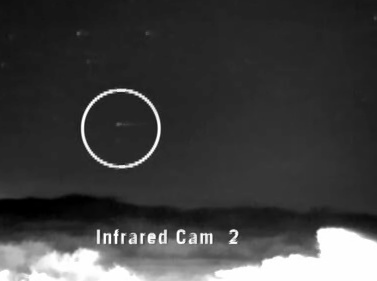 As the two team members dashed back, the cameras recorded superb footage of a completely inexplicable UFO burning bright in the night sky, darting back and forth as if to completely prove itself not to be any known craft of this world. Its ability to languish in the sky posing as a star and then suddenly rush east and then west, turning on a dime, left the investigators stunned. The entire episode can be seen HERE. Jeff's Phoenix UFO investigations and watch dogging is once again proven to be valid, and Phoenix remains a shocking hot spot of strange UFO activity, squelching any attempts to debunk the reality.